Fogbow at the Summit Research Station, Greenland. 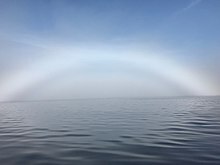 A fog bow, sometimes called a white rainbow, is a similar phenomenon to a rainbow; however, as its name suggests, it appears as a bow in fog rather than rain. Because of the very small size of water droplets that cause fog—smaller than 0.05 millimeters (0.0020 in)—the fog bow has only very weak colors, with a red outer edge and bluish inner edge. A fog bow seen in clouds, typically from an aircraft looking downwards, is called a cloud bow. Mariners sometimes call fog bows sea-dogs. A fog bow is seen in the same direction as a rainbow, thus the sun would be behind the head of the observer and the direction of view would be into a bank of fog (which may not be noticeable in directions away from the bow itself). Its outer radius is slightly less than that of a rainbow. When a fog bow appears at night it is called a lunar fog bow. ^ "Amazing white rainbow snapped over Scottish moor". BBC News Online. BBC. 22 November 2016. Retrieved 22 November 2016. ^ "What is a fogbow?". metoffice.gov.uk/. Met Office. Retrieved 22 November 2016. Auguste Bravais (1847) "Sur le phénomène de l'arc-en-ciel blanc" (On the phenomenon of the white bow in the sky), Annales de Chimie et de Physique, 3rd series, 21: 348–361. H. Mohn (February 23, 1888) "Letters to Nature: The fog bow and Ulloa's ring," Nature, 37: 391–392. James C. McConnel (March 22, 1888) "Letters to Nature: The fog bow," Nature, 37: 486–487. Wikimedia Commons has media related to Fogbow. Photos and explanation of fogbows at Atmospheric Optics. Fogbow image gallery at AKM website. Fogbows at Glows, Bows and Haloes site.